Last year marked the 15th anniversary of our association, but with plenty of work to do, the anniversary went by unnoticed in a busy atmosphere. This year started as intensely as the previous, and since our financial situation is precarious, we need your support to achieve our goals. So please, show your support by becoming a member or by making a donation, and we will continue to work just as hard on creating a world in which the voices of the oppressed are loud and clear! After a long 10-year phase-out period, on January 1, 2017, the Republic of Croatia finally celebrated the enforcement of the fur farming ban. The practical goal of this provision from the 2006 Animal Protection Act was to put an end to the cruel practice of breeding chinchillas for fur in Croatia. In 2015, the existence of this ban was threatened. However, after two years of persistent work, cooperation with celebrities in the campaign "Chinchillas rule," and the support of many individuals and organizations, the ban went into effect. After years of the Association's lobbying, activities, and public campaigns, such as "Life on a chain is not a life" with music band Picksiebner, the city of Zagreb implemented a ban on keeping dogs permanently chained through amendments to the Decision on conditions and manner of keeping pets and the treatment of abandoned and lost animals as of May 2015: "A dog must not be permanently chained or permanently kept in a fenced area." We are currently working to extend the ban to the territory of the entire state. The 2006 Animal Protection Act finally banned the use of wild animals in circuses and other animal shows. A big step forward on its own, this successful event is also important because of our initiative towards a permanent ban on the performance of any animal in circuses. Following this initiative, 32 towns in Croatia banned circus tours with animal performances. The discovery of beagles held in captivity and undergoing experimentation at the Faculty of Veterinary Medicine in Zagreb shook the country in July 2005. With our help, the big scandal was unveiled, exposing the involvement of employees at the Faculty of Veterinary Medicine and School of Medicine in Zagreb. The situation reached its climax several days later, when the dogs had their bones broken for the purpose of "research". The dogs were finally surrendered to Animal Friends and the SUZA Coalition. You can find their happy-end stories here. In June 2012, veterinary inspectors killed 46 healthy animals in just a few days under the pretense of conducting rabies control measures in the city shelter for stray animals located in Dumovec, the shelter of the Noina Arka Association, and in their adoptive homes. Veterinary inspectors and other veterinary officers entered the homes of our fellow citizens and took away both vaccinated and unvaccinated dogs or put them down right before the eyes of their distraught carers and families. After it was announced that both shelters would be closed for 6 months, members and volunteers protested a whole day in front of the Ministry of Agriculture. Due to these protests and the intense reactions from citizens, the shelters were reopened after only a week and a half. This effectively restarted the adoption process, which would have been hampered for 6 months. The veterinary inspectors who were involved in putting dogs down initiated court proceedings against Animal Friends, requesting compensation due to the pain and suffering inflicted to them after their names were made public. After several years of appeals to the Ministry of Agriculture and long-term campaigns with the goal of mandatory microchipping for all dogs, the Ordinance on dog identification finally entered into force on June 19, 2010, obligating guardians to microchip their dogs. Microchipping has many benefits, saving the animals from suffering and death and saving local communities great financial funds otherwise used to take care of animals belonging to irresponsible citizens. Many other activities were aimed at demanding responsible pet care, reminding everybody to microchip their animals so they can be easily tracked in case they get lost or wander away, and reducing the number of abandoned dogs. Thanks to our initiative and the support of our fellow citizens, the 2006 Nature Protection Directorate of the Ministry of Culture prohibited the import of fur and any other seal products in Croatia. In 2008, we joined the Scandinavian Anti-Sealing Coalition, Canadian Campaigns Against The Cruelty To Animals, and the Atlantic Canadian Anti-Sealing Coalition. We also initiated an international campaign to ban the sale of seal products across Europe. The ban on the "import of leather and leather products made from baby seal skin of certain seal species for commercial purpose" was also enacted through amendments to the Animal Protection Act in 2013. 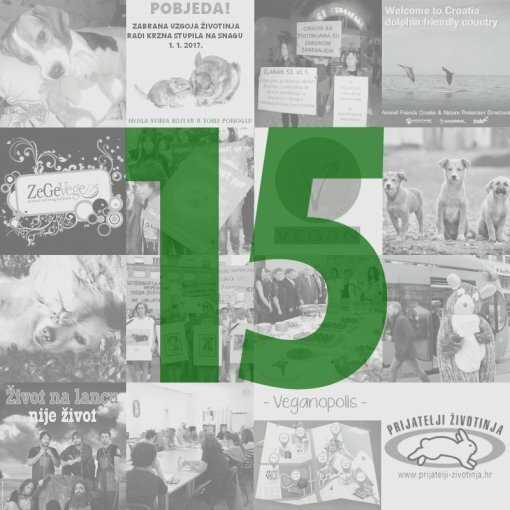 Starting in 2008, we've organized the annual ZeGeVege Festival of Sustainable Living in Croatia, part of the international Veganmania. Every year, more than 40,000 people attend the festival, where they can browse exhibitor stands offering healthy food, organic and sustainable products, and vegan cosmetics from Croatia and abroad. In 2016, the 100 exhibitor stands broke a record for business participation. The festival's rich program contains cooking courses and lectures covering veganism, ecology, and sustainability, and the variety of offerings attracts lots of attention. This unique Croatian festival, which exclusively exhibits and promotes plant-based and eco-friendly products, has been recognized as part of the cultural and tourist offering of the city of Zagreb. Understanding the common need of pet caregivers to use public transport, we tried to influence the amendment of the Decision on the public transportation in the city of Zagreb back in 2006. Our persistence eventually paid off -- on September 27, 2013, the city of Zagreb adopted the long-awaited provision allowing pets to travel on public transport, accompanied by their caregivers. The same decision is to be adopted in Osijek. Following almost all European member states, Croatia introduced the V-Label in 2009. The label has been used by the European Vegetarian Union to label vegetarian and vegan food for over 20 years. As representatives of the V-Label in Croatia, we arranged the introduction of the first V-Labels in Croatia for the health food suppliers Annapurna, Zrno, and Zvijezda. This label is a big help to the ever-growing number of vegetarians and vegans. Instead of having to carefully read the labels and lists of product ingredients, these conscious consumers are provided with a visible guarantee that the V-Labeled products contain no ingredients of animal origin. While the offer of V-Labeled products continues to expand, we regularly write to restaurants, cafés, and grocery stores asking to introduce vegan products into their offering. In 2008, we founded the Network Against Animal Abandonment, today known as the Animal Protection Network. This network is a coalition of over 60 animal protection organizations, as well as a large number of individuals and institutions, dedicated to ending animal abandonment, assuring their proper care, and protecting and promoting animal rights. The Animal Protection Network is supported by the Ministry of Agriculture and operates in collaboration with the Ministry's Office for Veterinary Inspection, the Veterinary Office, the City of Zagreb, as well as other state, regional, and local administrations. In addition to providing education and valuable information to its members, the Network also collects and forwards amendment proposals to relevant institutions. Over the last 10 years, and with the help of numerous veterinarians, we have encouraged people to neuter free living cats and adopted animals. The goal is to reduce the number of unwanted and abandoned animals, which are being poisoned, drowned, abused, and killed in many other terrifying ways on a daily basis. Every year, around 500 people take up the offer of affordable neutering. This is a huge number, especially considering that a single dog and his progeny may produce over 67,000 pups in just seven years, and the same count with cats reaches 420,000. After a two-month campaign against the building of the Vodnjan dolphinarium, on May 10, 2007, we received the official statement from the mayor of Vodnjan, Klaudio Vitasovic, affirming Vodnjan's decision to discontinue the project. Similar victories are being celebrated all around the world, such as SeaWorld’s decision to stop performing acts with killer whales in the face of public pressure. In May 2013, we organized a vegan lunch in the Office of the President of the Republic of Croatia, Ivo Josipovic. Our members and representatives used this occasion to warn the President that the Croatian Animal Protection Act is not being adequately enforced. We also emphasized the need for an animal protection inspection and the fact that, with over 160,000 vegetarians and vegans now living in Croatia, kindergartens and schools still do not provide meals to meet their needs, which is an infringement upon the basic human right to food. We are also hoping for an opportunity to present the vegan diet in a similar manner to the current president, Kolinda Grabar-Kitarovic. Through our numerous projects, such as "Spremi klopu (Prepare the food)," "Green Monday," and "Veganopolis," we encourage people to follow a healthy lifestyle and make positive changes. The Veganopolis project encompasses the Veggie Guide, detailing the selection of vegan products in Croatian supermarkets, and the Veggie Challenge, through which participants receive recipes and valuable information about veganism over a 30-day period. This project also offers nutritional advice for a balanced vegan diet and a list of restaurants with vegan options. Additionally, new vegans receive help and support in the form of a Vegan buddy. Thanks to this project, over 1,000 people joined the Veggie Challenge last year in Croatia.